For the British engineer, see Marc Isambard Brunel. Brunell with the Redskins in September 2006. Mark Allen Brunell (born September 17, 1970) is an American football coach and former quarterback who is the current head coach at the Episcopal School of Jacksonville. He was selected by the Green Bay Packers in the fifth round of the 1993 NFL Draft. He played college football at Washington. Brunell was a three-time Pro Bowl selection with the Jacksonville Jaguars. He has also played for the Washington Redskins, New Orleans Saints, and New York Jets. In 2009, he earned a Super Bowl ring as the backup quarterback and holder for the Saints' Super Bowl XLIV winning team against the Indianapolis Colts. Brunell was the starting quarterback for the St. Joseph High School Knights of Orcutt, California, in the 1985, 1986, and 1987 seasons. Brunell led his team to two league championships and one appearance in the CIF finals, California's version of the state championship series. Brunell signed with the University of Washington out of high school in 1988, a highly touted recruiting class that included future NFL players Lincoln Kennedy and Steve Emtman. Brunell saw his first action in his redshirt freshman year, and took over the starting duties in his sophomore season in 1990. Brunell's abilities as a run-pass combo quarterback flashed potential from his first start. In his third start, Brunell led the Huskies in a 31-0 romp over a highly ranked USC team, which established the Huskies of the early 1990s as a potential force in Pac-10 football. While Brunell continued to develop throughout his first season as a starter the Huskies climbed in the rankings. An early season loss to the eventual national champion Colorado and late season 25-22 loss to UCLA were the only setbacks for what, by season's end, was a dominant Husky team. With the Huskies crowned Pac-10 champions, Brunell played his best game yet in the Rose Bowl and was named the game's MVP as Washington coasted to a 46–34 win over Big Ten Conference Champion Iowa. After building a 39–14 lead after three quarters, Washington heavily substituted with reserves; the Hawkeyes scored twenty points in the fourth quarter. Though the Huskies finished the season ranked 5th in the Associated Press poll, one poll crowned them national champions. Irrespective of their final ranking, the Huskies, with Brunell's star rising, seemed set to soar to even loftier heights in 1991. Brunell was expected to lead the Huskies in 1991, but a devastating knee injury in the annual Husky spring game would sideline Brunell and cast the Husky hopes for a national championship run in doubt. Brunell, however, was capably replaced by Puyallup native Billy Joe Hobert and the University of Washington went on to win their first two games in Brunell's absence. Though Brunell was not yet fully recovered, he returned months ahead of schedule to action in Washington's third game in 1991. Brunell received a standing ovation upon his return in the 56-3 victory over Kansas State. Brunell would play occasionally in the remainder of Husky games as the season progressed, but usually entered the games well after the outcomes were no longer in doubt. The 1991 Washington team defeated every regular season opponent with most games providing plenty of playing time for younger and back up players. On January 1, 1992, Brunell played a small role (but threw a touchdown pass to Mario Bailey) in Washington's second straight Rose Bowl victory, this time over Michigan. Washington finished the season ranked first in the UPI poll and 2nd in the Associated Press poll, behind undefeated Miami. In 1992, with two successful quarterbacks returning (Hobert and Brunell), Brunell was unable to wrestle the starting QB spot away from Hobert and as such contributed in a limited role during their first eight games (all wins). However, during the week of November 2, 1992, the Los Angeles Times ran an exposé on Washington football wherein current starter Hobert was implicated in actions seemingly in violation of NCAA rules. As a result, Hobert was immediately suspended and Brunell was thrust back into the starting role for the Huskies. Now a senior, Brunell steered the devastated Huskies to one win in their last three regular season games. The Huskies, however, again won the Pac-10 and Brunell started his second Rose Bowl game, this time against Michigan. In 2015, Brunell was inducted into the Rose Bowl Hall of Fame. 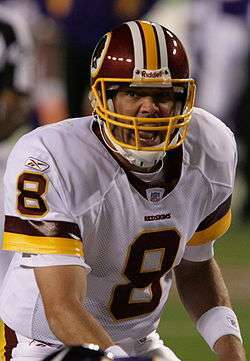 Following his senior season, Mark Brunell was selected by the Green Bay Packers in the 5th round of the 1993 NFL Draft. Many voices in the Seattle media were openly critical of the hometown Seahawks (who possessed the 2nd overall selection in the draft) for choosing to take Notre Dame QB Rick Mirer, instead of waiting to select Brunell. After two years with the Packers, he was acquired in 1995 by the Jacksonville Jaguars, in a trade for a 3rd round and 5th round pick in the 1995 draft. Brunell started 13 games in 1995, completed 201 out of 346 passes, for 2,168 yards, with 15 touchdowns and 7 interceptions. He also rushed for 480 yards. During his years in Jacksonville, Brunell was selected to the Pro Bowl three times, in 1997, 1998, and 2000 and awarded the Pro Bowl MVP in the 1997 game. With Brunell starting, the Jaguars won an AFC Central Division title and became the first NFL expansion team to make the playoffs three times in its first four seasons of play. The furthest he led the team was to the 1996 AFC Championship Game, which they lost to the New England Patriots. They returned again in 1999, but would lose to the Tennessee Titans. Brunell was benched in favor of Byron Leftwich following halftime of the third game of the 2003 season. It would be the final time Brunell took the field as a member of the Jaguars. As a starter since their inaugural season, Brunell left the team holding all of the Jacksonville Jaguars Records. In December 2013, Brunell was inducted into the Pride of the Jaguars, the team's Hall of Fame equivalent. He was traded to the Washington Redskins prior to the 2004 season. During the 2004 season, limited by a hamstring injury, Brunell struggled and would be benched midseason for backup quarterback Patrick Ramsey. Ramsey's play towards the end of that season and following pre-season would lead to a quarterback controversy where Brunell would be benched going into the 2005 season. This would change in 2005 after Ramsey suffered an early season injury that thrust Brunell back into the starter's role. In 2005, Brunell played much better and led the team to a 10–6 record and a playoff victory over the Tampa Bay Buccaneers. He finished third in the 2005 NFL Comeback Player of the Year awards. Brunell's most prolific moment in the 2005 season was during Week 2, when he completed two long passes to wide receiver Santana Moss for two touchdowns in the final four minutes of the fourth quarter to defeat the Dallas Cowboys on Monday Night Football, 14–13. On September 24, 2006, Brunell broke the NFL record for most consecutive completions in single game when he completed his first 22 passes against the Houston Texans. Brunell also set the Redskins franchise record for highest completion percentage in a single game (88.9%). The previous record was held by Hall of Fame quarterback Sammy Baugh for 66 years (87.5%). On November 13, 2006, after winning only three of their first nine games of 2006, Brunell was benched in favor of Jason Campbell, Washington's 2005 first round draft pick. Many experts and teammates felt he was the scapegoat for a team that was under performing across the board. Brunell underwent surgery on January 8, 2007, to repair a damaged labrum in his throwing shoulder, but returned in time for training camp. In 2007, Mark Brunell was surpassed on the Redskins' depth chart by Todd Collins. On March 13, 2008, Brunell was signed by the New Orleans Saints. As the Saints have not issued number 8 since Archie Manning retired, Brunell changed his jersey number to 11, the only time in his career he would wear a jersey number besides his customary number 8. 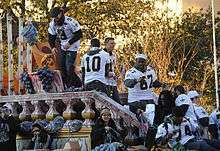 As backup quarterback behind Drew Brees (#9), Brunell (next to Chase Daniel (#10)) won his first Super Bowl title after the 2009 season with the New Orleans Saints. He entered the 2008 season as the backup to Drew Brees. He did not appear in a game in 2008. In 2009 he appeared in all 16 games as the holder on the Saints place-kicking unit, and saw his first playing time at quarterback in 3 years during a week 17 loss to the Carolina Panthers, as the Saints had already clinched homefield advantage and rested starter Drew Brees, as well as many other starters. Although he played little for the Saints, he was noted for his role as a veteran advisor to the Saints' starting quarterback, Drew Brees. On January 24, 2010, Brunell was the holder on the 40-yard field goal kicked by Garrett Hartley in overtime against the Minnesota Vikings in the NFC Championship game to send the New Orleans Saints to the team's first ever Super Bowl. On February 7, 2010, Brunell got his first and only Super Bowl ring with the New Orleans Saints when the team won its first franchise world championship by defeating the Indianapolis Colts 31-17 in Super Bowl XLIV. Brunell was a free agent after the 2009 season, and did not re-sign with the Saints. On July 28, 2010, he signed a two-year deal to play for the New York Jets. Brunell completed his first pass for the Jets on October 3 against the Buffalo Bills. In the last regular game of the 2010 season, while filling in for starting quarterback Mark Sanchez, Brunell threw his first scoring pass since 2006, a 17-yard touchdown pass to Santonio Holmes with 15 seconds left in the opening half. He then went on to throw a second scoring pass for 52 yards to Braylon Edwards in the second half. Brunell sat on the bench as the Jets made it to the AFC Championship but eventually lost to the Steelers 24-19. After one season with the Jets, he was released on July 29, 2011. He was re-signed two days later at a reduced salary. In April 2012, Brunell stated that he would like to play another season if the opportunity presented itself, contradicting a report from the Florida Times Union that he was ready to retire. When Washington Redskins quarterback Jason Campbell, who played quarterback for the team after Brunell, was asked what player he learned the most from in his career, Campbell said it was Mark Brunell. Campbell said "a nice tribute about how the man he replaced helped him become a better person off the field." Football Nation ranked Brunell the twenty-ninth best quarterback of the post-merger era. Brunell was an assistant football coach at Providence School in Jacksonville, Florida in 2012. In January 2013, Brunell became the new head football coach and program director at Episcopal School of Jacksonville. Episcopal went 2–8 in Brunell's first season, then improved to 8–3 in 2014. Brunell and his family have been active members of the Metro Morningstar Church in Sterling, Virginia (now Grace Covenant Church). When they were living in Florida, Brunell was very active within Southpoint Community Church, a church on the southside of Jacksonville that he helped found. He was also one of the most involved members of Champions for Christ. He also conducted volunteer work at the University of North Florida. Brunell's links with Champions for Christ has garnered some controversy, with the National Football League investigating CFC over concerns that players were being taken advantage of financially. Brunell is married to Stacy with a daughter, Caitlin, and three sons: Jacob, Joseph and Luke, Caitlin won the Miss Virginia's Outstanding Teen title in 2007 and then the Miss America's Outstanding Teen 2008 in a national pageant held in Orlando in August 2007. Caitlin won Miss Teen Jacksonville USA on February 28, 2009, and competed for the title of Miss Teen Florida USA in July 2009. Caitlin was also crowned Queen Shenandoah LXXXIV at the 84th Shenandoah Apple Blossom Festival on April 30, 2011 in Winchester, Virginia and was elected Miss University of Alabama in 2012. In June 2014 she was crowned Miss Alabama and will represent the state in the Miss America competition. Brunell has been credited in establishing numerous Whataburger fast food locations around the Jacksonville area. These businesses and the money they lost contributed to his bankruptcy proceedings. On June 25, 2010, Brunell filed for Chapter 11 bankruptcy, at least in part due to numerous failed real estate and other business investments. It is also reported that Brunell and several of his co-investors (also former teammates) have defaulted on 'multiple' loans involving different properties around the country. According to a Florida Times-Union report, Brunell listed approximately $5.5 million in assets against almost $25 million in liabilities. The liabilities are mostly in the form of personal guarantees on commercial real estate loans involving several of his limited liability corporations. The operation of 11 Whataburger franchise locations in which Brunell is involved will not be affected by the bankruptcy. Holds NFL record for most consecutive completions in a single game: 22. This record was set in a game vs Houston on September 24, 2006, and was later tied by David Carr of the same Houston Texans. ↑ Jason Reid (2008-03-13). "Bye, Bye Brunell". The Washington Post. Archived from the original on 2008-10-07. 1 2 Rich Cimini, "Jets sign veteran QB Brunell", ESPN.com, July 28, 2010. ↑ "NY Jets at Buffalo Box Score". Sports.yahoo.com. 2010-10-03. Retrieved 2010-11-18. ↑ Mehta, Manish. "Jets release backup QB Mark Brunell". New York Daily News. Retrieved 29 July 2011. ↑ "Jets sign Brunell, Bryan and 3rd-rd pick Ellis". The Wall Street Journal. Associated Press. 2011-07-31. Retrieved 2011-08-02. ↑ "Free agent quarterback Mark Brunell has 'no plans to retire yet'". Daily News. New York. ↑ "So, What Did You Bring for Show and Tell? Wise, Mike. Washington Post, October 29, 2008". Washingtonpost.com. 2008-10-29. Retrieved 2010-09-17. ↑ "Top 100 Modern Era Quarterbacks 40-21'". Football Nation. ↑ "Former Jaguars Quarterback Mark Brunell named head football coach at Episcopal School", firstcoastnews.com, January 6, 2013. ↑ Episcopal School of Jacksonville 2013 Football Schedule. ↑ Freeman, Mike (August 2, 1998). "Teams seek Inquiry into Religious Group". New York Times. Retrieved January 11, 2011. ↑ McKenna, Dave (October 6, 2006). "Voices From Above-Brunell's records aren't all from football". Washington City Paper. Retrieved January 11, 2011. ↑ Centazzo, Kim (2007-05-02). "Kniffin Collects Dresses, Makes Prom Reality". Connection Newspapers. Archived from the original on 2007-09-27. ↑ Queen Shenandoah LXXXIV: Caitlin Brunell Archived September 28, 2011, at the Wayback Machine. ↑ "Sophomore Caitlin Brunell crowned Miss UA 2012", al.com, February 24, 2012. ↑ "Whataburger to Sign Largest Ever Agreement for Florida; Pro Athletes, Texas Businessmen Join Forces to Build 28 New Restaurants in Jacksonville, Fla. Area". Findarticles.com. 2003-01-06. Retrieved 2010-09-17. ↑ Harding, Abel (2010-06-24). "Former Jaguar Mark Brunell filing for Chapter 11 bankruptcy". jacksonville.com. Retrieved 2010-09-17. ↑ "Mark Brunell to seek bankruptcy, former Pro Bowler says - ESPN". Sports.espn.go.com. 2010-06-25. Retrieved 2010-09-17. ↑ "Mark Brunell Files For Bankruptcy - Sports News Story - WJXT Jacksonville". News4jax.com. 2010-06-25. Archived from the original on 2010-06-28. Retrieved 2010-09-17. ↑ Bull, Roger (2010-06-29). "Bankrupt former Jaguars quarterback Mark Brunell owes $24.7 million". jacksonville.com. Retrieved 2010-09-17. Wikimedia Commons has media related to Mark Brunell.